Box Office Prediction: Will Salman Khan-Katrina Kaif Starrer Tiger Zinda Hai Witness Record-Breaking Opening Day? This Christmas, Salman Khan as Tiger in Tiger Zinda Hai is returning back to the Box Office. Salman Khan is all set to return to the big screen in all his glory with Tiger Zinda Hai opposite Katrina Kaif. TZH, a sequel to Ek Tha Tiger is receiving tremendous response ever since the first trailer of the film was released. The trailer of the film had taken the Internet by storm. The two chartbusters- ‘Dil Diyan Gallan’ and Swag Se Swagat’ have also hit the right chord. The hype around the film is increasing with each passing. As the release date of the film is getting closer, fans can’t keep calm. The advance booking of the film has already started all over, which only proves that the excitement will turn into huge numbers at the Box Office. YRF is known to make big budget extravaganza event and this time again with superstar Salman Khan, earlier Box Office reports are going to be destroyed. ‘Ek Tha Tiger’ had collected Rs 320 million (32 crores) at the Box Office on day one. Now how big Tiger Zinda Hai will open is a big question. 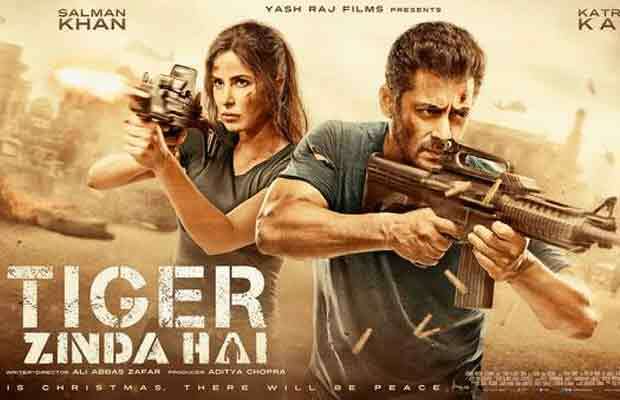 With too much hype surrounding the film, Tiger Zinda Hai is expected to witness an opening of around Rs 40 crore approx. and more. The actor’s last release, Tubelight clocked at Rs 21 crores at the box office but this is not going to be the case with this film. Tiger Zinda Hai is a story about Indian nurses taken hostage. Salman and Katrina battle it out to save their lives from terrorists. Just like its prequel Ek Tha Tiger, Tiger Zinda Hai too promises high octane action sequences. Tiger Zinda Hai releases on December 22. To sum it up, at this very moment ‘Tiger Zinda Hai’ is going to rewrite new rules and records at the Box Office. What do you think? Share your views in the comments section below. Meanwhile read: Salman Khan’s Tiger Zinda Hai Advance Booking Is Receiving Maddening Response! Previous articleBigg Boss 11 Contestant Sapna Chaudhary To Appear In This TV Show! Next articleBigg Boss 11: Here’s Why Luv Tyagi Got Saved From Eviction Last Week!